"Scholar, composer, conductor, teacher, author, music publisher, indefatigable advocate − Gunther Schuller isn't merely a musician, he's a monopoly." This description by Alan Rich in New York Magazine summarizes the multi-faceted career of this Pulitzer Prize-winning practitioner of the 28-hour day. Schuller coined the term "third stream" to describe the union of jazz and classical music − a clue as to how he straddled and combined the two genres. The son of German immigrants, Gunther Alexander Schuller was born in New York in 1925, appropriately enough on St. Cecelia Day, patron saint of musicians, November 22nd. After attending a private school in Germany, where an accident resulted in the loss of one eye, he returned to New York and enrolled at the St. Thomas Church Choir School, where he studied music and sang as a boy soprano. He also began to study flute and horn, and was engaged by the New York Philharmonic as a substitute hornist when he was 15. During his high school years, he also studied music theory and counterpoint at the Manhattan School of Music. He joined the Cincinnati Symphony as principal horn at age 17 and the orchestra of the Metropolitan Opera at age 19, where he played for 15 years. Although he was mostly hired as principal horn, Schuller later said that he loved playing fourth horn. He balanced his performing and composing careers by composing all night after playing opera performances. But by 1959 his schedule had become too arduous, and he decided to give up performing to devote himself more fully to composition. At the age of 25, Schuller taught horn at the Manhattan School of Music, beginning a distinguished teaching career; his positions have included Professor of Composition at the School of Music at Yale (1964-67), President of the New England Conservatory of Music in Boston (1967-77), Artistic Director of the Tanglewood Berkshire Music Center (1970-1984), the Spokane Bach Festival, and The Festival at Sandpoint (Idaho), and Co-Director of the Smithsonian Jazz Masterworks Orchestra. His love of a wide range of American music guided the activities of his publishing and recording companies, Margun Music (now part of G. Schirmer) and GM Recordings. Schuller created original compositions in virtually every musical genre, including commissions from the Baltimore Symphony, Berlin Philharmonic, Boston Symphony, Boston Musica Viva, Chicago Symphony, Minneapolis Symphony, National Symphony, and the New York Philharmonic. Commissions include his 1994 Pulitzer Prize-winning work Of Reminiscences and Reflections for the Louisville Orchestra; An Arc Ascending for the American Symphony Orchestra League and the Cincinnati Symphony; The Past is in the Present, also for the Cincinnati Symphony; a Sextet for Leon Fleisher and the Kennedy Center Chamber Players; Brass Quintet No. 2 for the American Brass Quintet; an Organ Concerto for the 1994 Calgary International Organ Festival; and Ritmica-Melodica-Armonica for the Newton Symphony Orchestra. In 2010 the Boston Symphony commissioned a large work, Where the Word Ends, and in 2014 performed his earlier Dreamscape in Boston and New York. He composed to the end of his life. Schuller was self-taught as a composer. He was partial to the 12-tone methods of the Second Viennese School, but he was not inextricably bound to them. Arnold Schoenberg and Duke Ellington were both musical lodestars. Schuller used serial technique in most of his compositions, and in fact used the same tone row in a number of diverse works. He wrote for unusual instrumental combinations, such as a Symphony for Brass and Percussion, quartets of four double basses and four cellos, more than 20 concertos, including for double bass, contrabassoon, alto saxophone, and a Grand Concerto for Percussion and Keyboards. Schuller gathered together a lifetime of observations on conducting in his book The Compleat Conductor (Oxford University Press). His extensive writings, on a variety of subjects ranging from jazz through music performance, contemporary music, music aesthetics, and education, have been issued in Musings: The Musical Worlds of Gunther Schuller. His monumental jazz history, The Swing Era, was published in 1989. 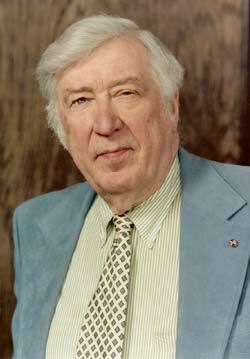 In 2011 he published an autobiography, Gunther Schuller: A Life in Pursuit of Music and Beauty. He wrote an article on the Brahms Horn Trio weeks before his death. Among Schuller's many awards are: a MacArthur Foundation “genius” Award (1991); the Pulitzer Prize (1994); inaugural Member of the American Classical Music Hall of Fame; DownBeat Lifetime Achievement Award; the Gold Medal for Music from the American Academy of Arts and Letters (1997); the BMI Lifetime Achievement Award (1994); the William Schuman Award (1988) given by Columbia University for "lifetime achievement in American music composition"; and several Grammy Awards. Though a high school drop-out, Schuller also received twelve honorary degrees from various colleges and universities. “As a composer and teacher,” composer Augusta Read Thomas, the chairwoman of the selection committee for the MacDowell award, said at the time, “he has inspired generations of students, setting an example of discovery and experimentation.”In 2000, the IHS elected Schuller an Honorary Member for his lifelong contributions to music and the horn. When contacted about the award, he said, "This is a special honor for me because I haven't played the horn since 1963. I am very grateful to be so honored in the company of many other great horn colleagues." While his numerous contributions to the larger music world are widely known, perhaps Schuller's best known contribution to the horn world is his book Horn Technique, first published in 1962 and later re-issued by Oxford University Press. His compositions, covering a full range of musical genres, have included or featured the horn in almost every one. In addition to his challenging large ensemble works, he composed numerous chamber works including horns in traditional settings (e.g., brass quintets) and innovative combinations, and as featured instrument: two horn concertos, a horn sonata (commissioned by the IHS), Lines and Contrasts for 16 horns, Five Pieces for Five Horns (recorded by Barry Tuckwell and the NFB Horn Quartet), and the Quintet for horn and strings (co-commissioned by the IHS, the Santa Fe Chamber Music Festival, Chamber Music Northwest, and the La Jolla Music Society and premiered by Julie Landsman and the Miró Quartet in 2009). Material from The Boston Globe and New York Times obituaries is included here.